Barnhardt, R., & Kawagley, A. O. (2005). Indigenous Knowledge Systems and Alaska Native Ways of Knowing. Anthropology and Education Quarterly, 36(1), pp. 8-23. A few years ago, a group of Alaska Native elders and educators was assembled to identify ways to more effectively utilize the traditional knowledge systems and ways of knowing that are embedded in the Native communities to enrich the school curriculum and enliven the learning experiences of the students. After listening for two days to lengthy discussions of topics such as indigenous world views, Native ways of knowing, cultural and intellectual property rights and traditional ecological knowledge, an Inupiaq elder stood up and explained through an interpreter that he was going to describe how he and his brother were taught to hunt caribou by their father, before guns were commonplace in the upper Kobuk River area of northern Alaska. The boys watched as their father proceeded to walk directly toward the caribou herd, which as he approached began to move away from him in a file behind the lead bulls, yet he just kept walking openly toward them. This had the two brothers scratching their heads wondering why their father was chasing the caribou away from him. Once the father reached the area where the caribou had been grazing, he stopped and put his bow and arrows down on the ground. As the (now) elder told the story, he demonstrated how his father then got into a crouching position and slowly began to move his arms up and down, slapping them against his legs as though he were mimicking a giant bird about to take off. The two brothers watched intently as the lead bulls in the caribou heard stopped and looked back curiously at their fathers movements. Slowly at first, the caribou began to circle back in a wide arc watching the figure flapping its wings out on the tundra, and then they began running, encircling their father in a closing spiral until eventually they were close enough that he reached down, picked up his bow and arrows and methodically culled out the choice caribou one at a time until he had what he needed. He then motioned for his sons to come down and help prepare the meat to be taken back to the village. Indigenous peoples throughout the world have sustained their unique worldviews and associated knowledge systems for millennia, even while undergoing major social upheavals as a result of transformative forces beyond their control. Many of the core values, beliefs and practices associated with those worldviews have survived and are beginning to be recognized as having an adaptive integrity that is as valid for todays generations as it was for generations past. The depth of indigenous knowledge rooted in the long inhabitation of a particular place offers lessons that can benefit everyone, from educator to scientist, as we search for a more satisfying and sustainable way to live on this planet. Actions currently being taken by indigenous people in communities throughout the world clearly demonstrate that a significant paradigm shift is under way in which indigenous knowledge and ways of knowing are beginning to be recognized as consisting of complex knowledge systems with an adaptive integrity of their own (cf. Winter, 2004 special issue of Cultural Survival Quarterly on indigenous education). As this shift evolves, it is not only indigenous people who are the beneficiaries, since the issues that are being addressed are of equal significance in non-indigenous contexts (Nader 1996). Many of the problems that are manifested under conditions of marginalization have gravitated from the periphery to the center of industrial societies, so the new (but old) insights that are emerging from indigenous societies may be of equal benefit to the broader educational community. The tendency in the earlier literature on indigenous education, most of which was written from a non-indigenous perspective, was to focus on how to get Native people to acquire the appurtenances of the Western/scientific view of the world (Darnell 1972; Orvik and Barnhardt 1974). Until recently there was very little literature that addressed how to get Western scientists and educators to understand Native worldviews and ways of knowing as constituting knowledge systems in their own right, and even less on what it means for participants when such divergent systems coexist in the same person, organization or community. It is imperative, therefore, that we come at these issues on a two-way street, rather than view them as a one-way challenge to get Native people to buy into the western system. Native people may need to understand western society, but not at the expense of what they already know and the way they have come to know it. Non-Native people, too, need to recognize the co-existence of multiple worldviews and knowledge systems, and find ways to understand and relate to the world in its multiple dimensions and varied perspectives. The intent of this article is to extend our understanding of the processes of learning that occur within and at the intersection of diverse world views and knowledge systems through a comparative analysis of experiences derived from across multiple Fourth World contexts, drawing in particular on our work with the Alaska Rural Systemic Initiative over the past ten years. The article will outline the rationale behind a comprehensive program of educational initiatives that are closely articulated with the emergence of a new generation of indigenous scholars who are seeking to move the role of indigenous knowledge and learning from the margins to the center of the educational research arena and thus take on some of the most intractable and salient issues of our times. As a group, Native American students are not afforded educational opportunities equal to other American students. They routinely face deteriorating school facilities, underpaid teachers, weak curricula, discriminatory treatment, and outdated learning tools. In addition, the cultural histories and practices of Native students are rarely incorporated in the learning environment. As a result, achievement gaps persist with Native American students scoring lower than any other racial/ethnic group in basic levels of reading, math, and history. Native American students are also less likely to graduate from high school and more likely to drop out in earlier grades (2003:xi). Indigenous people have had their own ways of looking at and relating to the world, the universe, and to each other (Ascher 2002; Eglash 2002). Their traditional education processes were carefully constructed around observing natural processes, adapting modes of survival, obtaining sustenance from the plant and animal world, and using natural materials to make their tools and implements. All of this was made understandable through demonstration and observation accompanied by thoughtful stories in which the lessons were imbedded (Kawagley 1995; Cajete 2000). However, indigenous views of the world and approaches to education have been brought into jeopardy with the spread of western social structures and institutionalized forms of cultural transmission (Barnhardt and Kawagley 1999). Recently, many Indigenous as well as non-Indigenous people have begun to recognize the limitations of a mono-cultural education system, and new approaches have begun to emerge that are contributing to our understanding of the relationship between indigenous ways of knowing and those associated with western society and formal education. Our challenge now is to devise a system of education for all people that respects the epistemological and pedagogical foundations provided by both indigenous and western cultural traditions. While the examples used here will be drawn primarily from the Alaska Native context, they are intended to be illustrative of the issues that emerge in any indigenous context where efforts are underway to reconnect education to a sense of place and its attendant cultural practices and manifestations. While western science and education tend to emphasize compartmentalized knowledge which is often de-contextualized and taught in the detached setting of a classroom or laboratory, indigenous people have traditionally acquired their knowledge through direct experience in the natural world. For them, the particulars come to be understood in relation to the whole, and the laws are continually tested in the context of everyday survival. Western thought also differs from indigenous thought in its notion of competency. In western terms, competency is often assessed based on predetermined ideas of what a person should know, which is then measured indirectly through various forms of objective tests. Such an approach does not address whether that person is actually capable of putting that knowledge into practice. In the traditional Native sense, competency has an unequivocal relationship to survival or extinctionif you fail as a caribou hunter, your whole family may be in jeopardy . You either have it, or you don't, and it is tested in a real-world context. Traditional knowledge is the information that people in a given community, based on experience and adaptation to a local culture and environment, have developed over time, and continue to develop. This knowledge is used to sustain the community and its culture and to maintain the genetic resources necessary for the continued survival of the community (2003:3). Indigenous people do a form of science when they are involved in the annual cycle of subsistence activities. They have studied and know a great deal about the flora and fauna, and they have their own classification systems and versions of meteorology, physics, chemistry, earth science, astronomy, botany, pharmacology, psychology (knowing one's inner world), and the sacred (Burgess 1999). For a Native student imbued with an indigenous, experientially grounded, holistic world view, typical approaches to schooling can present an impediment to learning, to the extent that they focus on compartmentalized knowledge with little regard for how academic subjects relate to one another or to the surrounding universe. To bring significance to learning in indigenous settings, the explanations of natural phenomena are best understood by students if they are cast first in indigenous terms to which they can relate, and then explained in western terms. For example, when choosing an eddy along the river for placing a fishing net, it can be explained initially in the indigenous way of understanding, pointing out the currents, the movement of debris and sediment in the water, the likely path of the fish, the condition of the river bank, upstream conditions affecting water levels, the impact of passing boats, etc. Once the students understand the significance of the knowledge being presented, it can then be explained in western terms, such as flow, velocity, resistance, turbidity, sonar readings, tide tables, etc., to illustrate how the modern explanation adds to the traditional understanding (and vice versa). All learning can start with what the student and community already know and have experienced in everyday life. The indigenous student (as with most students) will then become more motivated to learn when the subject matter is based on something useful and suitable to the livelihood of the community and is presented in a way that reflects a familiar world view (Kawagley 1995; Lipka 1998; Battiste 2000). Indigenous knowledge is not static, an unchanging artifact of a former lifeway. It has been adapting to the contemporary world since contact with others began, and it will continue to change. Western science in the North is also beginning to change in response to contact with indigenous knowledge. Change was first seen in the acceptance that Inuit (and other Native northerners) have knowledge, that is know something. Then change moved to involving Inuit in the research process as it is defined by western science. Then community-based research began, wherein communities and native organizations identified problems and sought the means to solve them. I believe the next stage will be one in which Inuit and other indigenous peoples grapple with the nature of what scientists call research (1990:8). Resolving the various concerns that indigenous peoples have about the development of scientific based information must be addressed through both policy and programs. This begins with reformulating the principles and guidelines within which research will be carried out and involves the process of consultation and the development of appropriate techniques for identifying problems that indigenous peoples wish to see resolved. But the most important step that must be taken is to assure that indigenous environmental and ecological knowledge becomes an information system that carries its own validity and recognition. A large effort is now underway in certain areas within the circumpolar region, as well as in other parts of the world, to establish these information systems and to set standards for their use (1993:27). Indigenous societies, as a matter of survival, have long sought to understand the regularities in the world around them, recognizing that nature is underlain with many unseen patterns of order. For example, out of necessity, Alaska Native people have made detailed observations of animal behavior (including the inquisitiveness of caribou). They have learned to decipher and adapt to the constantly changing patterns of weather and seasonal cycles. The Native elders have long been able to predict weather based upon observations of subtle signs that presage what subsequent conditions are likely to be. The wind, for example, has irregularities of constantly varying velocity, humidity, temperature, and direction due to topography and other factors. There are non-linear dimensions to clouds, irregularities of cloud formations, anomalous cloud luminosity, and different forms of precipitation at different elevations. Behind these variables, however, there are patterns, such as prevailing winds or predictable cycles of weather phenomena that can be discerned through long observation (though global climate change is taking its toll on weather predictability). Over time, Native people have observed that the weathers dynamic is not unlike the mathematical characteristics of fractals, where patterns are reproduced within themselves and the parts of a part are part of another part which is a part of still another part, and so on. When engaging in the kind of comparative analysis of different world views outlined above, any generalizations should be recognized as indicative and not definitive, since indigenous knowledge systems are diverse themselves and are constantly adapting and changing in response to new conditions. The qualities identified for both indigenous and western systems represent tendencies rather than fixed traits, and thus must be used cautiously to avoid overgeneralization (Gutierrez and Rogoff 2003). At the same time, it is the diversity and dynamics of indigenous societies that enrich our efforts as we seek avenues to integrate indigenous knowledge systems in a complementary way with the system of education we call schooling. The sixteen distinct indigenous cultural and language systems that continue to survive in villages throughout Alaska have a rich cultural history that still governs much of everyday life in those communities. For over six generations, however, Alaska Native people have been experiencing recurring negative feedback in their relationships with the external systems that have been brought to bear on them, the consequences of which have been extensive marginalization of their knowledge systems and continuing erosion of their cultural integrity. Though diminished and often in the background, much of the Native knowledge systems, ways of knowing and world views remains intact and in practice, and there is a growing appreciation of the contributions that indigenous knowledge can make to our contemporary understanding in areas such as medicine, resource management, meteorology, biology, and in basic human behavior and educational practices (James 2001). Alaska Natives have been at the forefront in bringing indigenous perspectives into a variety of policy arenas through a wide range of research and development initiatives in recent years. In the past two years alone, the National Science Foundation has funded projects incorporating indigenous knowledge in the study of climate change, the development of indigenous-based math curriculum, the effects of contaminants on subsistence foods, observations of the aurora, and alternative technology for waste disposal. In addition, Native people have formed new institutions of their own (e.g., the Consortium for Alaska Native Higher Education, the Alaska Native Science Commission and the First Alaskans Institute) to address some of these same issues through an indigenous lens. Why do Iñupiat share traditional knowledge? Despite the stigma, our community is proud of a long history of productive, cooperative efforts with visiting researchers, hunters, travelers, scientists, map makers and others. We share when we consider others close enough to be part of Iñupiat culture and share when it is in the best interest of a greater cultural struggle (Glenn 2000:1314). In an effort to address the issues associated with converging knowledge systems in a more comprehensive way and apply new insights to address long-standing and often intractable problems, in1995 the University of Alaska Fairbanks, under contract with the Alaska Federation of Natives and with funding support from the National Science Foundation program, entered into a ten-year educational development endeavorthe Alaska Rural Systemic Initiative. The most critical salient feature of the context in which this work has been situated is the vast cultural and geographical diversity represented by the sixteen distinct indigenous linguistic/cultural groups distributed across five major geographic regions, as the following map illustrates. Through the Alaska Rural Systemic Initiative (AKRSI), a statewide network of 20 partner school districts was formed, involving a total of 176 rural schools serving nearly 20,000 predominately Alaska Native students. 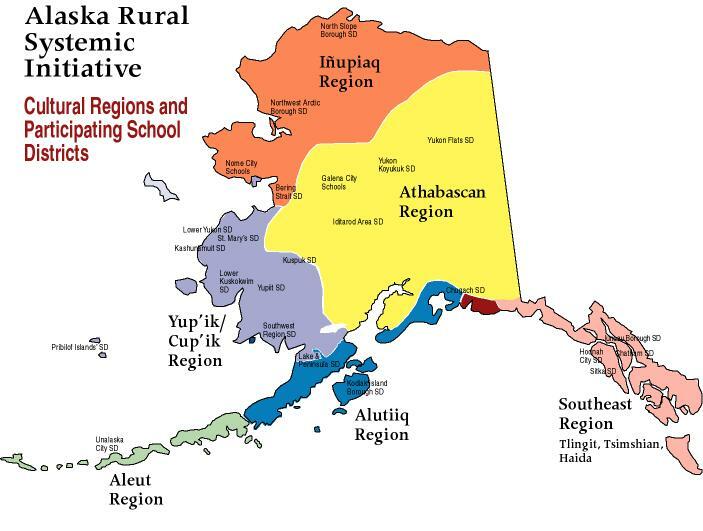 The remaining 28 rural school districts in Alaska (103 rural schools serving mostly non-Native communities) have served as a comparison group for assessing the impact of the AKRSI initiatives. Utilizing an educational reform strategy focusing on integrating local knowledge and pedagogical practices into all aspects of the education system, this established network of partner schools serving diverse indigenous populations has provided a fertile real-world context in which to address the many issues associated with learning and indigenous knowledge systems outlined above. Over a period of ten years, these initiatives have served to strengthen the quality of educational experiences and consistently improve the academic performance of students in participating schools throughout rural Alaska (AKRSI Annual Report 2003). In the course of implementing the AKRSI initiatives, we have come to recognize that there is much more to be gained from further mining the fertile ground that exists within indigenous knowledge systems, as well as at the intersection of converging knowledge systems and world views. 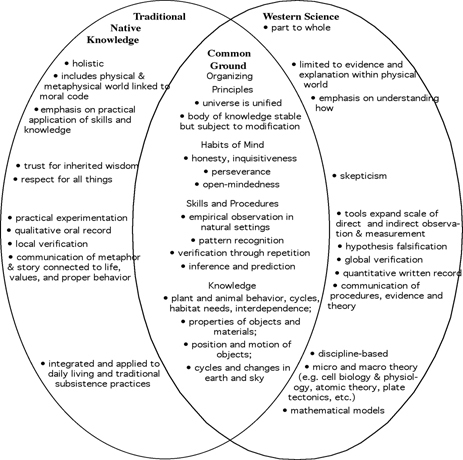 The following diagram is intended to capture some of the critical elements that come into play when indigenous knowledge systems and western science traditions are put side-by-side and nudged together in an effort to develop more culturally responsive science curricula (Stephens 2000). Although educators obviously differ in their perspective, there is no doubt that the creation of culturally responsive science curriculum has powerful implications for students for at least three reasons. The first is that a student might conceivably develop all of the common ground skills and understandings while working from and enhancing a traditional knowledge base. The second is that acquisition of the common ground, regardless of route, is a significant accomplishment. And the third is that exploration of a topic through multiple knowledge systems can only enrich perspective and create thoughtful dialog (2000:10-11). Indigenous scholars discovered that indigenous knowledge is far more than the binary opposite of western knowledge. As a concept, indigenous knowledge benchmarks the limitations of Eurocentric theory  its methodology, evidence, and conclusions  reconceptualizes the resilience and self-reliance of indigenous peoples, and underscores the importance of their own philosophies, heritages, and educational processes. Indigenous knowledge fills the ethical and knowledge gaps in Eurocentric education, research, and scholarship (2002:5). Examples of what this fresh vantage point looks like are provided in recently developed curriculum materials that seek to integrate western and indigenous knowledge in a complementary way (cf. Aikenhead 2001; Adams and Lipka 2003; Carlson 2003). Indigenous people themselves have begun to rethink their role and seek to blend old and new practices in ways that are more likely to fit contemporary conditions. There are ways to break out of the mindset in which we are oftentimes stuck, though it takes some effort. There are ways to develop linkages that connect different worldviews, at least for a few people under the right conditions. The kinds of insights that emerge from such efforts often open up as many questions as answers. We have learned a tremendous amount from recent experience, and we find each year that the more we learn the less we know, in terms of having penetrated through another layer of understanding of what life in an indigenous context is all about, only to recognize the existence of many additional layers that lie beyond our current understanding. The initiatives outlined above have brought together the resources of indigenous-serving institutions and the communities they serve to forge new configurations and collaborations that break through the obfuscations associated with conventional paradigms of research on cultural influences in learning. Alaska, along with the other indigenous cultural regions of the world, provides a natural laboratory in which indigenous and non-indigenous scholars can get first-hand experience integrating the study of learning and indigenous knowledge systems. There are numerous opportunities to probe deeper into the basic issues that arise as we explore terrain that has always been a part of our existence, but is now being seen through new multi-dimensional lens that provide greater breadth and depth to our understanding. Given the comprehensive nature of indigenous knowledge systems, they provide fertile ground for pursuing a broad interdisciplinary research agenda. In the next section we will identify some of the most promising research opportunities that have emerged from the intersection of indigenous knowledge systems and western educational and scientific endeavors. The study of indigenous knowledge systems as it relates to education falls into three inter-related research themes: documentation and articulation of indigenous knowledge systems; delineating epistemological structures and learning/cognitive processes associated with indigenous ways of knowing; and developing/assessing educational strategies integrating indigenous and western knowledge and ways of knowing. These issues encompass some of the most long-standing cultural, social and political challenges facing education in indigenous societies around the world. Public debate on these issues has revolved around apparent conflicts between educational, political and cultural values, all of which are highly interrelated, so it is essential that future research address the issues in an integrated, cross-cultural and cross-disciplinary manner, and with strong indigenous influence. Following is a brief description of some of the major research initiatives that have emerged from the study of indigenous knowledge systems. Native Ways of Knowing/Indigenous Epistemologies: Indigenous scholars have begun to identify the epistemological underpinnings and learning processes associated with indigenous knowledge systems (Kawagley 1995; Cajete 2000; Meyer 2001). The Venn diagram depicting the intersection of traditional Native knowledge and western science presented earlier contains numerous topical areas in which comparative research can be undertaken to gain a better understanding of the inner-workings of the many and varied indigenous knowledge systems around the world, as well as a more detailed explication of the elements of common ground that emerge when the diverse knowledge systems interact with one another. Collaboration among scholars across the indigenous cultural regions will enhance the degree of generalizability that can be achieved as well as facilitate the transfer of knowledge to other related sectors. Culturally Responsive Pedagogy/Contextual Learning: The development and implementation of the Alaska Standards for Culturally Responsive Schools and Guidelines for Respecting Cultural Knowledge by the Assembly of Alaska Native Educators (1998) has fostered a great deal of promising innovation in schools seeking to integrate indigenous knowledge and ways of knowing into their curriculum and pedagogical practices. While there appears to be a strong positive correlation between the implementation of the Cultural Standards in the schools/ communities and Native student academic performance, the details of those associations have not yet been fully delineated. The research implications and opportunities in this area are of considerable interest and potential consequence with regard to how we approach schooling in general, not just in indigenous settings. Research initiatives should engage scholars incorporating multiple research traditions and theories associated with cultural and contextual influences on learning, teaching and cognition. Of particular interest are the implications of current theories associated with various forms of contextually-driven teaching and learning (Johnson 2000). Ethno-mathematics: Ethno-mathematics has emerged in the last decade as a powerful blending of insights from the mathematical sciences and cross-cultural analysis (Asher 2002; Eglash 2002). The National Council of Teachers of Mathematics recently published a collection of articles under the heading, Changing the Faces of Mathematics: Perspectives on Indigenous People of North America, several of which reflected research from Alaska (Hankes and Fast 2002). Alaska has been at the forefront in the development of curriculum materials that utilize Alaska Native constructs such as fish rack construction, egg gathering, salmon harvesting and star navigation as an avenue for teaching mathematical content that prepares students to meet national and state standards and related assessment mandates (Adams and Lipka 2003). All of these recent breakthroughs in our understanding of how mathematical knowledge is constructed and utilized provide extensive opportunities for research on mathematics learning across cultures that has significant implications for schooling, particularly since mathematics is one of the critical elements in the current assessment systems associated with No Child Left Behind. Indigenous Language Learning: Indigenous languages are an integral part of indigenous knowledge systems and thus warrant particular attention in our efforts to understand how to better integrate learning in school with the cultural context of the home/community in indigenous societies. Research issues associated with indigenous languages extend beyond the makeup of the language itself to include the thought processes imbedded in the language, as well as how, when, where and for what purposes the language is used (sociolinguistics). Only then can we begin to understand what happens to an indigenous knowledge system when the language associated with that system of thought is usurped by another (G.H. Smith 2002). Cross-Generational Learning/Role of Elders/Camps: A dominant theme throughout the Alaska Standards for Culturally Responsive Schools (Assembly of Alaska Native Educators 1998) is the importance of drawing Native elders into the educational process and utilizing natural learning environments in which the knowledge that is being passed on to the students by the elders takes on appropriate meaning and value and is reinforced in the larger community context. While available data affirms the broad educational value of cross-generational learning in culturally appropriate contexts (Johnson 2002; Battiste 2002), the dynamics associated with such learning has not yet been well documented and translated into comprehensive pedagogical or curricular strategies. Place-based Education: The importance of linking education to the physical and cultural environment in which the student/school is situated has special significance in indigenous settings, where people have acquired a deep and abiding sense of place and relationship to the land in which they have lived for millennia (Barnhardt and Kawagley 1999; Semken and Morgan 1997). Place-based educational practices have received wide-spread national recognition and support as a way to foster civic responsibility while also enriching the educational experiences for all studentsrural and urban, indigenous and non-indigenous alike (G. Smith 2002; Gruenewald 2003; Sobel 2004). Indigenous scientific and cultural knowledge associated with local environments is a critical ingredient for developing an interdisciplinary pedagogy of place (Cajete 2000). As such, these systems of knowledge offer many opportunities for comparative research into how traditional indigenous ways of learning and knowing can be drawn upon to expand our understanding of basic educational processes for all students. Native Science/Sense-Making: The ways of constructing, organizing, using, and communicating knowledge that have been practiced by indigenous peoples for centuries have come to be recognized as constituting a form of science with its own integrity and validity, as indicated by a day-long AAAS-sponsored symposium on Native Science at its 2003 meeting (Lambert 2003). Mainstream science also has its distinctive ways of constructing, organizing, using and communicating knowledge. Both Native and mainstream knowledge systems are largely implicit, however, and while they overlap, they also diverge in ways important to how knowledge is learned and applied. Native scholars have been actively contributing their insights to the growing body of literature around the themes of Native science and sense-making (Cajete 2000; James 2001; Krupnik and Jolly 2002; Hankes and Fast 2002). Cultural Systems, Complexity and Learning: An area of special interest in exploring the implications of indigenous knowledge systems and the structures by which they are perpetuated is the potential insights that can be gained from the application of complexity theory to our understanding of the dynamics that occur when diverse knowledge systems collide with one another (Eglash 2002; Barnhardt and Kawagley 2003). Since this is a sufficiently broad (and complex) arena with many convergent, divergent and emergent properties and possibilities, it has the potential to evolve as a significant research theme that capitalizes on the recent insights gained from the study of complex adaptive systems and through which we can apply those insights to stimulate the development of self-organizing structures that emerge from interactions within and between diverse knowledge systems. Indigenizing Research in Education: Until recently, research traditions in education have been dominated by western science methods, models and practices, including those applied to indigenous peoples. In 1999, Maori scholar Linda Tuhiwai Smith published Decolonizing Methodologies: Research and Indigenous Peoples, which articulated the importance of indigenous people devising and using their own research methodologies and addressing issues from frames of reference that derive from within their own communities and cultural traditions. Indigenous scholars are in a position to enlarge the scope of research paradigms in ways that will benefit all research traditions. The research topics outlined above have the potential to advance our understanding of learning as it occurs in diverse cultural contexts by exploring the interface between indigenous and western knowledge systems, as well as contributing to the further conceptualization, critique and development of indigenous knowledge systems in their own right, drawing on the experiences of indigenous peoples from around the world. The expansion of the knowledge base associated with learning and indigenous knowledge systems will contribute to an emerging interdisciplinary body of scholarly work regarding the critical role that the local cultural context can play in fostering academic success in learning, particularly among indigenous peoples. An underlying theme of this article has been the need to reconstitute the relationship between indigenous peoples and the immigrant societies in which they are embedded. By documenting the integrity of locally situated cultural knowledge and skills and critiquing the learning processes by which such knowledge is transmitted, acquired and utilized, Alaska Native and other indigenous people are engaging in a form of self-determination that will not only benefit themselves, but will open opportunities to better understand learning in all its manifestations and thus inform educational practices for everyones benefit. Traditional processes for learning to hunt caribou by observation and meaningful participation can offer insights into how we create opportunities for students learning to operate a computer. To overcome the long-standing estrangement between indigenous communities and the external institutions impacting their lives, all parties in this endeavor (community, school, higher education, state and national agencies) will need to form a true multi-lateral partnership in which mutual respect is accorded the contributions that each brings to the relationship. The key to overcoming the historical imbalance in that regard is the development of collaborative research endeavors specifically focusing on education and indigenous knowledge systems, with primary direction coming from indigenous people so they are able to move from a passive role subject to someone elses agenda to an active leadership position with explicit authority in the construction and implementation of the research initiatives (Harrison 2001). In this context, the task of achieving broad-based support hinges on our ability to demonstrate that such an undertaking has relevance and meaning in the local indigenous contexts with which it is associated, as well as in the broader social, political and educational arenas involved. By utilizing research strategies that link the study of learning to the knowledge base and ways of knowing already established in the local community and culture, indigenous communities are more likely to find value in what emerges and be able to put the new insights into practice toward achieving their own ends as a meaningful exercise in real self-determination. In turn, the knowledge gained from these efforts will have applicability in furthering our understanding of basic human processes associated with learning and the transmission of knowledge in all forms. 2003 Building a Fish Rack: Investigations into Proof, Properties, Perimeter and Area. Calagary, AB: Detselig Enterprises. 2001 Integrating Western and Aboriginal Sciences: Cross-Cultural Science Teaching. Research in Science Education 31(3): 337-355. 2003 Annual Report. Fairbanks: Alaska Native Knowledge Network (ankn.uaf.edu/arsi.html), University of Alaska Fairbanks. 1993 A Research Program on Indigenous Knowledge, Anchorage, AK: Inuit Circumpolar Conference. 2002 Mathematics Elsewhere: An Exploration of Ideas Across Cultures. Princeton, NJ: Princeton University Press. 1998 Alaska Standards for Culturally Responsive Schools. Fairbanks: Alaska Native Knowledge Network , University of Alaska Fairbanks. 2004 Culture, Chaos and Complexity: Catalysts for Change in Indigenous Education. Cultural Survival Quarterly 27(4): 59-64. 2002 Domestication of the Ivory Tower: Institutional Adaptation to Cultural Distance. Anthropology and Education Quarterly 33(2): 238-249. 1999 Education Indigenous to Place: Western Science Meets Indigenous Reality. In Ecological Education in Action. Gregory Smith and Dilafruz Williams, eds. Pp. 117-140. New York: State University of New York Press. 2002 Indigenous Knowledge and Pedagogy in First Nations Education: A Literature Review with Recommendations. Ottawa: Indian and Northern Affairs Canada. 1990 Cross-Cultural Epistemology: Cultural Readaptation Through the Pursuit of Knowledge. Edmonton: Department of Anthropology, University of Alberta. 1999 Traditional Knowledge: A Report prepared for the Arctic Council Indigenous Peoples' Secretariat. Copenhagen: Indigenous Peoples' Secretariat, Arctic Council. 2000 Native Science: Natural Laws of Interdependence. Sante Fe, NM: Clear Light Publishers. 1996 The Web of LIfe: A New Scientific Understanding of Living Systems. New York: Doubleday. 2003 Unangam Hitnisangin/Unangam Hitnisangis: Aleut Plants. Fairbanks: Alaska Native Knowledge Network. 2004 What is Traditional Knowledge? Traditional Knowledge Systems in the North. Anchorage: (http://www.nativescience.org/html/traditional_knowledge.html) Alaska Native Science Commission. 1972 Education in the North: The First International Conference on Cross-Cultural Education in the Circumpolar Nations. Fairbanks: Center for Northern Education Research, University of Alaska Fairbanks. 2002 Computation, Complexity and Coding in Native American Knowledge Systems. In Changing the Faces of Mathematics: Perspectives on Indigenous People of North America. Judith E. Hankes and Gerald R. Fast, eds. Pp. 251-262. Reston, VA: National Council of Teachers of Mathematics. 2000 Traditional Knowledge, Environmental Assessment, and the Clash of Two Cultures. In Handbook for Culturally Responsive Science Curriculum. S. Stephens, ed. Pp. 13-14. Fairbanks: Alaska Native Knowledge Network. 2003 The Best of Both Worlds: A Critical Pedagogy of Place. Educational Researcher 32(4): 3-12. 2003 Cultural Ways of Learning: Individual Traits or Repertoires of Practice. Educational Researcher 32(5): 19-25. Hankes, Judith E. and Gerald R. Fast, eds. 2002 Changing the Faces of Mathematics: Perspectives on Indigenous People of North America. Reston, VA: National Council of Teachers of Mathematics. 2003 Traditional Knowledge and Intellectual Property. Washington, D.C.: American Association for the Advancement of Science. 2001 Collaborative Programs in Indigenous Communities. Walnut Creek, CA: AltaMira Press. 2001 Science and Native American Communities. Lincoln, NE: University of Nebraska Press. 2002 Contextual Teaching and Learning. Thousand Oaks, CA: Corwin Press. 1998 The Indigenous Worldview of Yupiaq Culture: It's Scientific Nature and Relevance to the Practice and Teaching of Science. Journal of Research in Science Teaching 35(2): 133-144. Krupnik, Igor and Dyanna Jolly, eds. 2001 The Earth is Faster Now: Indigenous Observations of Arctic Environmental Change. Fairbanks: Arctic Research Consortium of the United States. 2003 From 'Savages' to Scientists: Mainstream Science Moves Toward Recognizing Traditional Knowledge. Tribal College Journal of American Indian Higher Education 15(1): 11-12. 1998 Transforming the Culture of Schools: Yup'ik Eskimo Examples. Hillsdale, NJ: Lawrence Erlbaum Associates. 2001 Our Own Liberation: Reflections on Hawaiian Epistemology. The Contemporary Pacific 13(1): 124-148. 1996 Naked Science: Anthropological Inquiries into Boundaries, Power and Knowledge. New York, NY: Routledge. Orvik, James, and Ray Barnhardt, eds. 1974 Cultural Influences in Alaska Native Education. Fairbanks: Center for Northern Education Research, University of Alaska Fairbanks. 2000 The Indigenous Way. In EarthDance: Living Systems in Evolution, Elisabet Sahtouris. New York, NY: iUniversity Press: 323-343. 1997 Navajo Pedagogy and Earth Systems: Journal of Geoscience Education, 45(1): 109-112. 2002 Place-based Education. Phi Delta Kappan 84(2): 584-594. 2002 Kaupapa Maori Theory: An Indigenous Theory of Transformative Praxis. Auckland, NZ: University of Auckland/Te Whare Wananga o Awanuiarangi. 1999 Decolonizing Methodologies: Research and Indigenous Peoples. New York: Zed Books. 2004 Place-Based Education: Connecting Classrooms and Communities. Great Barrington, MA: The Orion Society. 2000 Handbook for Culturally Responsive Science Curriculum. Fairbanks: Alaska Native Knowledge Network. 2003 A Quiet Crisis: Federal Funding and Unmet Needs in Indian Country, Washington, D.C.: U.S. Commission on Civil Rights.